I generally favor clothes in solid colors and monochromatic palettes, which is a little odd because my house is filled with pattern and color. Perhaps it’s not so odd because . . . a person is not a sofa. These patterns are lively, but not overwhelming — in part because the palette is limited to camel, yellow, cream, and chocolate brown. I love these colors together; they form a harmonious scheme. But let’s have a word about the sweater. 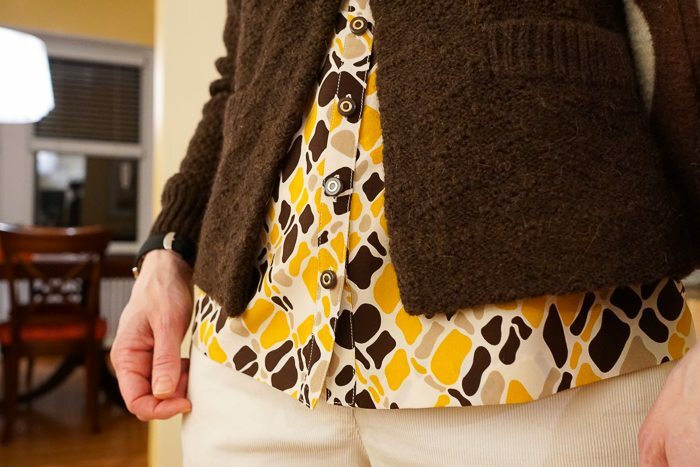 This sweater features a little pattern-mixing of its own. The body is a seed stitch and the sleeves are, um, something else. Knitters, help me! Is it a honeycomb? These shoes are from Cole Haan, but I bought them many years ago. Since the shoes are no longer available, we’ll draw a lesson from them because even if these particular shoes aren’t available, other are. The Lesson: A good pair of leopard print shoes is worth a little investment. They will delight you every time you wear them and you will wear them more than you’d imagine. This is how my shoes look to me. As previously discussed on The Directrice, see About Animal Prints, this leopard coloring looks great with pinks (from carnation to blush), navy, a variety of reds (ranging from orange to blue undertones), pistachio green, lavender. This is how my shoes look to Harper. I love pattern mixing! I have worked in retail many years, and many of those years in menswear, where pattern mixing is a regular thing. 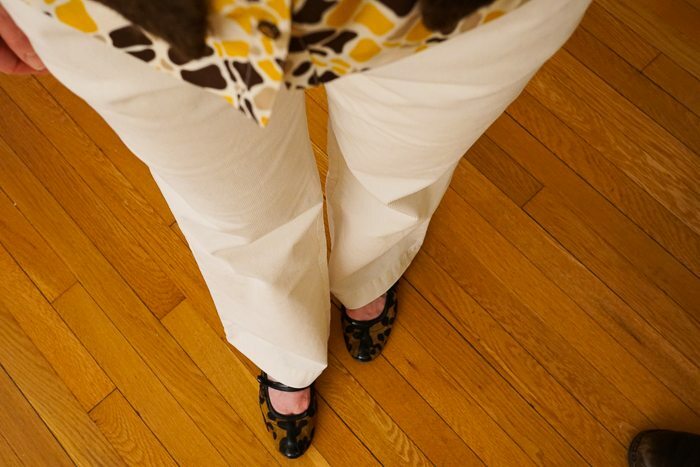 I treat striped shirts as a solid, often wear patterned scarves, and you are right about leopard flats. When I first got mine, I wore them as the only pattern in an outfit…with all black, or black pants and a red jacket. Now I wear them where I would wear a black or brown flat. Mine are Stuart Weitzman, printed hair calf, about five years old and I baby them so they look good as new. I wouldn’t have said you favor solid colors as I see lots of interesting things going on in your outfits. 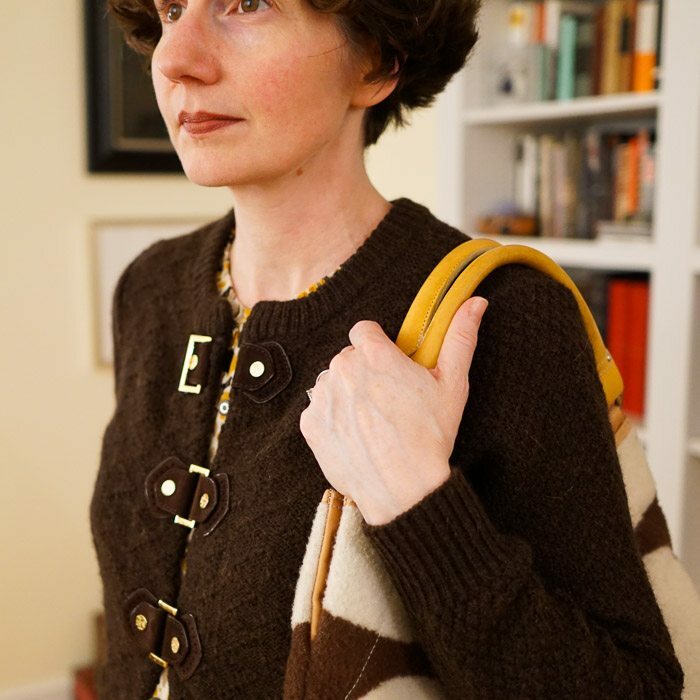 The sweater and bag in this post are lovely. I’m starting to realize that I need to rethink button-up sweaters. 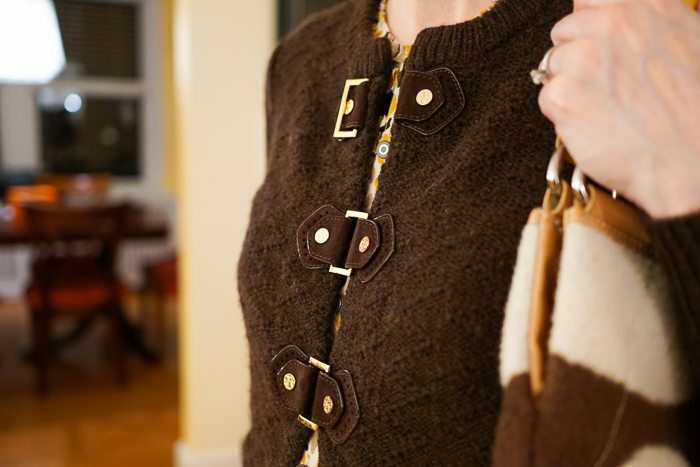 I’ve avoided them thinking them matronly, but your sweater outfits are anything but matronly! I see now that I need to look for fitted sweaters. As an aside, over the summer I bought a pair of leopard print Sam Edelman fashion sneakers. I thought they would be easy to combine, but I haven’t worn them much. I need to go back to your Animal print post. Fantastic outfit. 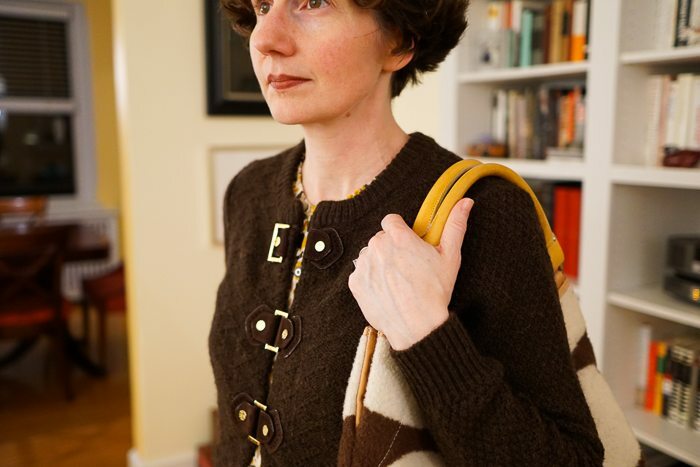 love love love it all especially the cunning sweater with the amazing buckles. 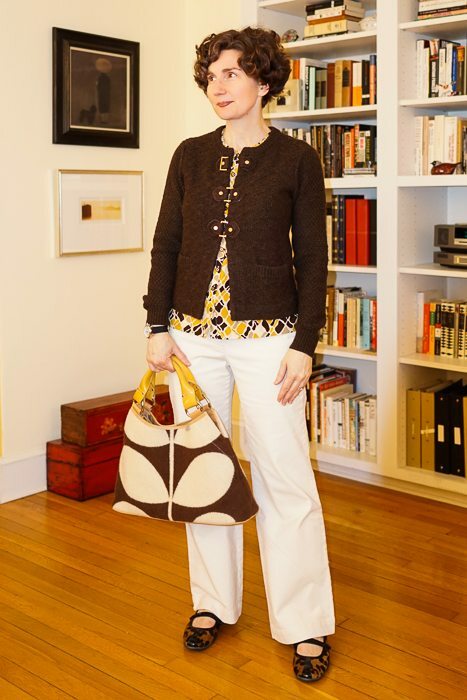 The blouse and the bag pull it all together. Only quibble is that I would have gone with black doc martin’s with yellow laces, rather than the animal print slippers, to GROUND the costume in some black leather solidity. But bravo, Directrice, bravo! desh’s comment is exciting to me, as I just got some new black Doc Martens and some yellow laces, but have lacked the outfit with which to wear them. YOUR outfit is perfect. I think an important factor that makes your pattern-play work here is that you’re not only grounded in a narrow but interesting color palette, but you’re also working with patterns of different scale. The bag (that bag!) *needs* that graphic, large-scale print, against the smaller print of the blouse. That sweater is perfection, too. The buckles are fun and the texture is so cozy. First I think this outfit is fabulous….as a knitter, I was trying to see the sleeves of that sweater, but I couldn’t make them out! The fasteners just make that sweater sing. You might be changing my mind about animal prints. And I agree with all the of the above: my sweaters need more buckles! This whole outfit is fabulous.